Isn't that one of the most adorable faces you've ever seen? 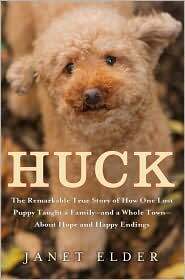 It was that face that originally attracted me to Janet Elder's book, Huck: The Remarkable True Story of How One Lost Puppy Taught a Family - and a Whole Town - About Hope and Happy Endings. To be honest, the town actually understood hope. It was Janet Elder, after a bout with cancer, who had to learn to hope again. Janet Elder and her husband were in their late thirties when their only son, Michael, was born. From the time he was a baby, Michael loved dogs, and for years, he asked for one for Christmas, to no avail. Janet and Rick always had an excuse. They lived in an apartmetn in Manhattan. She worked for the New York Times; Rich travelled a lot. With two full-time working parents, the answer to Michael was always no. But, when Janet was diagnosed with breast cancer at 48, Michael was only eleven. Once she learned it was going to be a lengthy treatment, she convinced her husband that they needed to get Michael a dog, one to hug and be there for him. It would be symbol of hope to hold out for him once her treatment was done. And, she even said, "It was going to be good for all of us to have a puppy, a new life at the center of our lives, a declaration of faith in the future." For Michael, it was love at first site when a reddish brown toy poodle puppy arrived. He called him Huck, and the two were just meant for each other. And, when the family left for a much-needed trip to Florida, it was difficult to leave Huck with Janet's sister in Ramsey, New Jersey. Perhaps Janet had a premonition. "I started wondering if it was a mistake to leave Huck in a place so unfamiliar to him." BIG mistake. Within twenty-four hours, Huck was gone, and the family had to rush back to try to find him. How do you find a puppy that has run away? It might take a village to raise a child, but it took four towns, and a number of people to find a runaway. Two thirds of the book is about those people who helped in the search. Rich led the search, never giving up in the attempt to find Huck. And, Elder chronicles the prayers, posters, and people who assisted in the search for Huck. Huck is the story of a dog, and community. However, as a book, it is padded. It's not easy to put together three hundred pages about a puppy, and a search for it. Elder, naturally, has to include the events that led up to it, beginning with Michael's passion for dogs, and culminating in her cancer. But, details about New Jersey and Tampa could have been edited. We really didn't need to know all the details about Tampa, and shopping there. However, I have to admit, without padding there really isn't much of a story here. Bought a dog, loved a dog, lost if for a few days, hunted for it, and brought it home. I'm glad Huck was found. He is an adorable dog. And, I know Elder's story is how the community helped them find Huck. But, I think I wasted a little too much time reading a three hundred page book in which one drama happens, and we know the outcome from the cover of the book. Huck by Janet Elder. Crown, ©2010. ISBN 9780767931342 (hardcover), 304p. FTC Full Disclosure - I requested a copy of this book, in order to read and review it. Oh, gee, another adorable dog. I know I would cry through this book, for Janet and her cancer diagnosis, for her son who loved and momentarily lost his dog, and for poor Huck who was out in the wilderness alone for a few days. I think I'll skip this based on your recommendations. And wondering how is Janet doing, but if she wrote a book like this, she's okay. Isn't Huck adorable? At least at the time of writing, Janet Elder was doing OK. It was an interesting book, but my heart just wasn't into this one. Maybe it was because Huck was lost for over half the book, and you knew he was found. That was good. People probably wouldn't read it if they thought he was never found, and that Michael's heart was broken. But, it just seemed to go on so long. I know as much as anything the story was about everyone who helped find Huck. But, with that many people, no one was fully developed, and you never really knew anyone. In fact, I only really felt as if I knew Michael. I just cannot read this type of book. I know I'm missing some wonderfully life affirming stories, but I just can't do it. But oh my - that little Huck's face is, without a doubt, one of the most endearing ever! You're not a wimp, Kaye. And, I have one coming up that I'm a little worried about. We'll see if I can read it. I agree. That face is just too cute. I fell in love with that adorable little face! I even got a bit teary-eyed. Just wanted to let you know that I am doing fine, I thankfully passed the five year mark last spring. Huck is still as cute as ever! Congratulations to you Janet. That is great to hear. And so glad Huck is doing well and as cute as ever. What a face! I saw a dog on tv this morning who had been an "owner surrender," to the local animal shelter. He looked like Huck. I wonder how people can give up such adorable dogs, but these days many people are doing so because of the economic crisis--they can't afford to take care of their pets and have children to feed, and all the rest of that. That to me is so heart-breaking. When I see that, it just does me in for the pets who look bewildered and sad, and for the families, especially the children who have to give up beloved pets. Thankfully, Huck found his family. A family having to give up their beloved pet for financial reasons is utterly heartbreaking. How awful for everyone -- the dog and the family, but as you say, especially the kids. Your description of the heart of the matter, and the human-canine bond is wonderful. Thank you, Robert. I'm glad that came through. You know that this one is right up my alley, Lesa - despite your warning that it's a bit lengthy. The cover is unbelievably cute. And I'm already intrigued about the one you mentioned that you're worried about reading. It is up your alley, Ingrid. That cover is just the cutest dog cover I've ever seen. What a charmer! I'll let you know. I'm starting that book next week. We'll see.